This Fodera Monarch Deluxe 5 string features a stunning burled walnut top with matching pickup covers, and headstock veneer. The sustain seems to go on forever and harmonics are easy to get in every position of the fretboard. Built 7/21/2007. This bass is in excellent, near-mint condition. The frets have no wear on them. The neck is straight as an arrow. It's set up perfect with super fast and low action. It plays like a dream! New price for this bass would be $11,500. Grab this killer bass for a great deal! Every Emperor Standard is hand-crafted right in Fodera's Brooklyn, New York shop alongside their custom instruments by the very same people, using the same tools and materials as their Custom basses. Featuring a Mahogany body, beautiful Figured Grenadillo Top, Birdseye Maple Fingerboard, 34" Scale, and Fodera/Pope 3-Band Preamp with Seymour Duncan Dual Coils. Part of a small batch run Fodera built for us. This bass has woods that we hand selected with the Fodera team that make them more similar to Fodera's custom build basses. This one upgraded with premium Poplar Burl top and Ebony fingerboard. This MG-shaped Imperial 5-string features a Walnut body, Alder tone block, Ebony fingerboard, and 3-peice Ash neck. The tone of this instrument can be best described as warm, yet punchy and articulate, with deep, fat lows, slightly compressed mids, and clear, bell-like highs. 35" scale length also contributes to giving this bass a super tight low B. Also featrured on this instrument is a gorgeous Redwood Burl solid top, giving it visual flair to accompany its great sound. This Imperial 5-string features an Ash body, Alder tone block, and Indian Rosewood fingerboard. The tone of this bass is warm yet punchy with a deep, fat low end, and smooth, singing highs. A versatile instrument like this one is great for the working player who needs the tonal flexibility to cover a broad range of musical styles, thanks to its blend of tone woods and Duncan dual-coil pickups! This instrument also features a gorgeous Crotch Walnut solid-top with matching wooden pickup covers! Featuring a Walnut body and Ebony fingerboard, giving it a deep, punchy tone with percussive lows, precise mids, and a clear bell-like high end. The 35" scale serves to increase the string tension, making for a super tight B string! 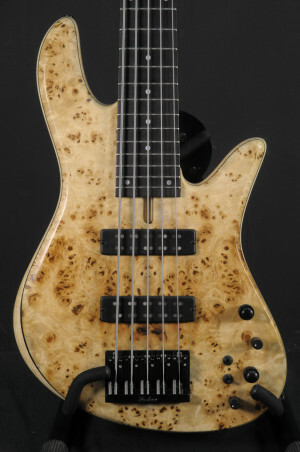 This bass also features a Spalted Maple top with matching wooden pickup covers, for a gorgeous look.